Flora Payne never thought she’d run a barbecue shop. But when her husband Horton Payne tragically passed away in 1984, his widow along with his mother, co-founder Emily Payne, took the reins of the restaurant. The name ‘Horton’ is still proudly displayed, stenciled on the building’s bright-red awning. Flora and her son Ron have maintained all of the flourishes that Horton and Emily Payne made special. The pork shoulders are still turned over hickory coals, in a recessed pit set into the wall. The mild sauce simmers all afternoon on the stove. The hotter variety is dispensed via an old liquid soap bottle. Coleslaw is the color of day-glo green, its bright hue energetically sizzles between the meat and bun of a chopped pork sandwich. We first visited Payne’s Bar-B-Q in 2002 as part of our initial foray into documenting Memphis ‘cue, a project that included photographs, original essays and a smattering of oral history interviews. 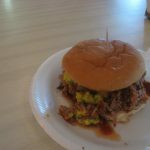 Visit the original Payne’s Bar-B-Q page.